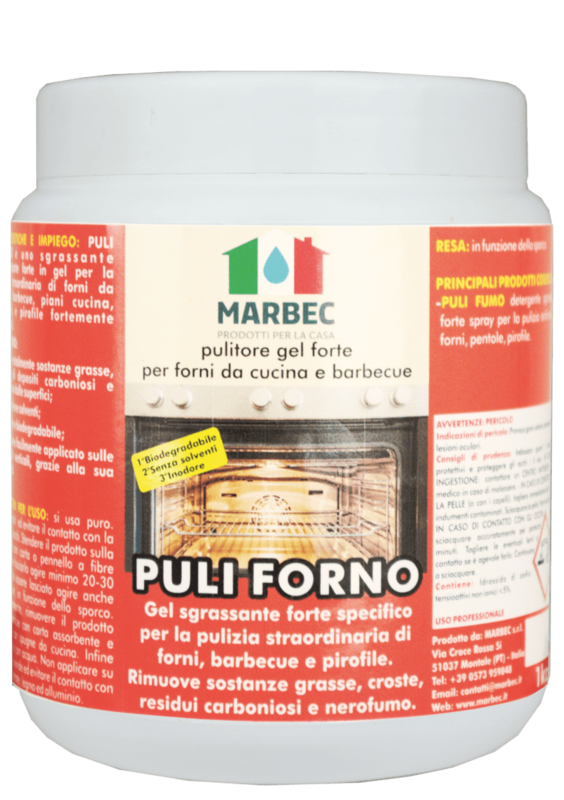 Product that quickly removes grease, carbon residues and soot, even the most obstinate; in the form of gel, it is easily applicable also on vertical surfaces. Odorless and without solvents. Degreaser-discrostante of kitchen and barbecue ovens. completely removes grease, carbon deposits and soot from surfaces. It does not contain solvents and is odorless. Due to its viscosity it may be falcimente applied on vertical surfaces. Using pure. Use gloves and avoid contact with skin and eyes. Spread the product on the surface with paper or plastic fiber brush and let it work at least 10-20 minutes. Next, remove paper from the surface and wipe with kitchen sponges. Finally, risciacqure with water. Do not use equipment in plant material or animal. Avoid contact with treated surfaces, wood and aluminum. Depending on the dirt to be removed. Sign up and keep up-to-date with our news!